Because God loved us with His unlimited love through Jesus, we make it our first priority to love Him. It means we listen to Him and follow and rejoice in His will, instead of following our own desires. That is our source of life. None of us can maintain this way of life alone. We need the friends in church who rejoice in the same God and support each other. We need to learn that we are able to love each other even if our love is not perfect. We are also given the role to love all people outside of church in the way that God loves them. 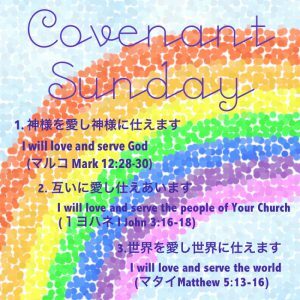 This way of loving God and people is the covenant we are expected to keep as a Your Church member. 1) Why do we need to become a member of a church? 2) Why do you (not) want to become a Your Church member?